Two weeks ago I decided I was going to just play around with the start of making an adventure game. There have a been a few detours but I'm going to stick with it until I have something very simple complete - perhaps a character that can walk around a scene and a simple hidden key / door puzzle. Most recently I was writing the code to allow the character to navigate the scenes and I've now uploaded it to the source repository. 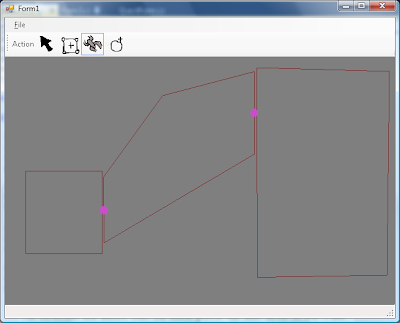 The Editor project has a simple GUI editor to create NavMeshes. The next step will be adding a way to test the pathfinding, backgrounds and an animated character to move around the screen. Looks like an interesting start, will keep watch. Yes I think whipping up a Doom level editor wouldn't be that hard :D Though the current editor is a little unintuitive. The text shouldn't appear over the bamboo there should be a pale orange background that the black text sits over. What browser are you using? I'll check out and change it if I can't fix it.